Redwood City Little League (RWCLL) has a zero tolerance policy for behavior that is disrespectful, discourteous, or may in any way be construed as intimidating towards its umpires. The League must develop a strong Corps of Umpires and RCWLL must develop a policy which supports our umpires and helps our team of umpires grow. With this policy, we hope to maintain an environment in RWCLL that is both umpire friendly and that teaches our players to have respect for those in positions of authority. Violations of this policy will result in disciplinary actions including suspensions and potentially expulsion from RWCLL. The type of disciplinary actions that will be applied to an incident will vary due to the nature of the interaction. Players, coaches, and fans should understand that any critical behavior towards umpires (the kind that is all too common at professional sporting events and some other youth sports programs) will not be tolerated in RWCLL. Basically, we want every coach and parent to treat the umpire the way they would want their son or daughter to be treated if it was their son or daughter that was the umpire. It is far more productive for a player, coach, or team to react to disadvantageous umpire calls by focusing on how to overcome those "bad breaks," rather than focusing on the umpire who is just doing the best that he/she can. Our umpire crew is comprised of both adult volunteers and youths between the ages of 10 and 18 years old. Over 90% of RWCLL games this year will be officiated by youth umpires. Our youth umpire program is an important part of our mission to provide the kids of Redwood City with a positive environment to grow and learn through sports, develop leadership skills, plus give them a chance to have a place to get some job experience. 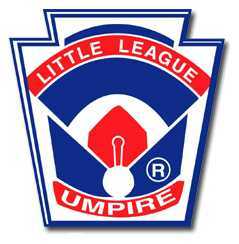 Also, our Little League adult umpires are volunteers and are not paid. All our umpires must feel they are safe and protected. • No questioning or comments from spectator areas regarding umpire calls. • You should recognize that your actions on the field are viewed by both parents and players on both teams and therefore they should set the highest standard of behavior. Any and all communications with umpires should be done in a respectful and deferential manner. • Coaches are also expected to exercise control of their players and parents. Failure to be proactive in this regard will also place coaches at disciplinary risk. We know that coaches can’t guarantee parent and player behavior however, coaches are expected to take responsibility for proactively intervening early in situations that could put a player or parent at disciplinary risk. • Judgment calls by an umpire can never be questioned. • Interpretations of a rule may be questioned but only in a quiet and respectful way by requesting to approach the umpire. For example, if a coach wanted to discuss the proper penalty for an interference call it would be appropriate since there are guidelines spelled out in the Green Book and it is not up to umpire discretion. However, arguing the umpire's judgment to call interference is not acceptable. If something cannot be resolved on the field refer to the protest rules in the Green Book. • Always speak directly to the umpire who made the call you are unclear of. You may not demand that an umpire seek help from another umpire. Umpires, are not allowed to "over rule" each other on the field. They may, at their discretion, consult with the other umpire for help. If they do consult with each other their final judgment will be accepted as the final ruling on the field. •Yelling across the field at an umpire over a call is not acceptable. Yelling can come across as hostile even when you don't intend for it to. Request a time out to approach the umpire and discuss the situation in a respectful and conversational manner. Please remember that an adult coach approaching a youth umpire can be somewhat intimidating in and of itself, so a coach acting in a deferential manner will go a long way to mitigating that. Finally, there will be absolutely no touching, bumping, or other kind of physical or verbal abuse of any umpire. Any physical altercation with or verbal abuse of a league umpire will in most cases lead to severe disciplinary action. Any comments regarding an RWCLL umpire can be submitted by email to the Chief Umpire and to the Division Player Agent.